The embed there skips ahead of most of their trailer, which shows at least a little of something resembling a story, which the mainline Monster Hunter games don't really have. That could also help attract a Western audience. BUT, LET'S TALK ABOUT THAT THERE MEGA MAN. We just celebrated at the start of December the awesome announcement that Mega Man 11 will exist and release in 2018, and it's sporting sleek, modern graphics. 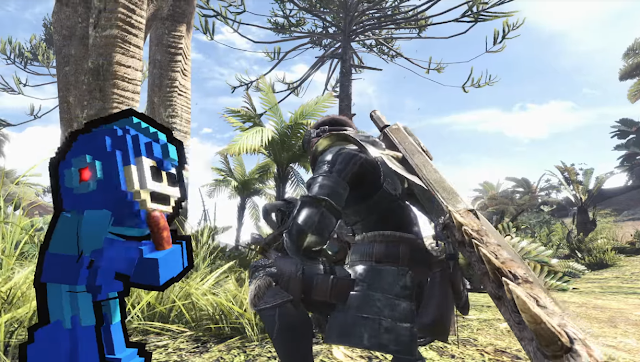 Right after that, CAPCOM releases that trailer featuring this Minecraftian Mega Man as a costume for your Palico companion. Blocky Mega Man struggling to eat a... sausage? I'd struggle with that, too, but I wouldn't simultaneously look hideous. That's the total opposite of sleek or modern. I cannot recall when Mega Man has ever looked like that. I mean, obviously it's a 3D representation of his 8-bit NES sprite, but I do not believe they have ever given him a 3D pixellated look like that. Mega Man will be featured in FREE downloadable content, specifically called an “online event quest” with dates to be announced later. When you use one of his many weapons, the background music changes to one of the 8-bit background music classics from the NES Mega Man games. Obviously, these are spectacular songs, and after I wrote that sentence, I've been listening to the whole Mega Man 4 soundtrack. While Europeans won't care at all about Mega Man, Americans will! I just hope this cameo's return to a long-gone era isn't a signal for what will happen to Mega Man 11, because much of our collective excitement for Mega Man 11 is predicated on Mega Man 11 being modern. By the way, there will be a SECOND (the first was 10 days ago) weekend beta for Monster Hunter: World for PlayStation 4 players this December 22. If you can, try it and let me know if CAPCOM still has no idea how to get newcomers to appreciate the Monster Hunter series, because KoopaTV's staff is forever turned off by how horrible the Monster Hunter 3 Ultimate demo is on the 3DS. It's not newcomer-friendly at all, and newcomers are who CAPCOM needs to please for Monster Hunter: World to succeed. Ludwig only wrote about this because he received a request asking for him to write anything about Monster Hunter: World. You, dear reader, are free to submit a request as well on the Requests page! Ludwig also suggests that you be on KoopaTV this December 22 instead of on a PlayStation 4, because something very exciting will be published on that day. STAY TUNED. I only played a little of Monster Hunter Ultimate 4, but it was enough to tell me that the series is just not for me. I found the tasks to be tedious, and it seemed like it took a lot of grinding just to level up. Monster Hunter fans state that the franchise's grinding is different than standard RPG grinding in that it's tied to your skill and it's fun. Megaman in MY Monster Hunter? Heresy! And I hope they don't go overboard with this funny "story" business. Story is the mortal enemy of his rival "replay value" and the two just cannot coexist. Hence games like Life is Strange or even The Last Guardian have no replay value. Luckily Monster Hunter is not meant to be replayed, but rather, being perfectionized in a single save file. This is interesting in regard to something completely virgin to the Monster Hunter franchise, which nobody (except me) seems to talk about: the bane of video gamers existence, worse than lootboxes, more dreadful than DLCs, I'm talking about - achievements. Or games like Prey with achievements that force you to replay the game 4 times. So I really hope they keep the achievements nice and easy like "Complete the main story", "Slay a Apholohlgopos","Play with friends","Stand around for 2 minutes" and "Exist". Because it would really spoil the soup if they try to turn gamers into maniac completionists, with achievements like "collect a size gold-crown for every single monster in this game" (the probabilities of encountering a gold-crown size (veeery small or veeeery big specimen) monster of any given type are veeeery slim.) or "collect every type of dung" or "slay 100 monsters with that weapon that you never even use". That being said I'm glad Monster Hunter freed itself from the handheld tartarus, because idek who had the idea that this would be appropriate. The closest thing to Monster Hunter is Dark Souls and just imagine playing Dark Souls on your 3DS, who would want that. The Playstation is where Monster Hunter belongs to. Welcome home. There are no levels in Monster Hunter, only better weapons and armor (your character is just a mere mortal without those) as well as your skill, just like in Dark Souls. And the first "tasks" are tedious, because they have you collect herbs and cook meat and whatnot. The game starts getting fun if you hunt down Monsters (who would have thought) (and stops being fun when the monsters wreck you so hard you want to cry). "KoopaTV's staff is forever turned off by how horrible the Monster Hunter 3 Ultimate demo is on the 3DS"
If Phoenix Wright cameos in Monster Hunter, will you be more likely or less likely to try Ace Attorney? It SOUNDS like Monster Hunter and story WOULD go together, then, if it's meant to be perfected in a single save file. I know I would be more likely in being interested in it if it had a story. It's been on our internal "topics to write about" list to write about Achievements and their effects on player behaviour for years, but it sounds like in Monster Hunter people make up their own achievements as they go along since they're self-motivated to go out and quest for rare gear. I mean, aren't Monster Hunterers already manic completionists? That's why they play the games for hundreds and hundreds of hours. Monster Hunter was probably on handhelds lately because Japan likes handhelds more than consoles, and they were selling to Japanese people. Now they want to sell to Westerners, so it's back to a console push. That demo is NOT for newcomers. It was meant for existing fans of the series, even though it was the first time the series was on the 3DS. Awful. I got a demo for the Wii game a long time ago from Capcom Unity themselves but never even tried it. I just had no interest. ...Well, guess you'll continue to have no interest.